Game, Set, Marathon: Anderson Wins Record-Shattering Wimbledon Semifinal Kevin Anderson needed more than six and a half hours to beat his American opponent, John Isner. It was easily the longest match that late in a major tournament in men's tennis history. 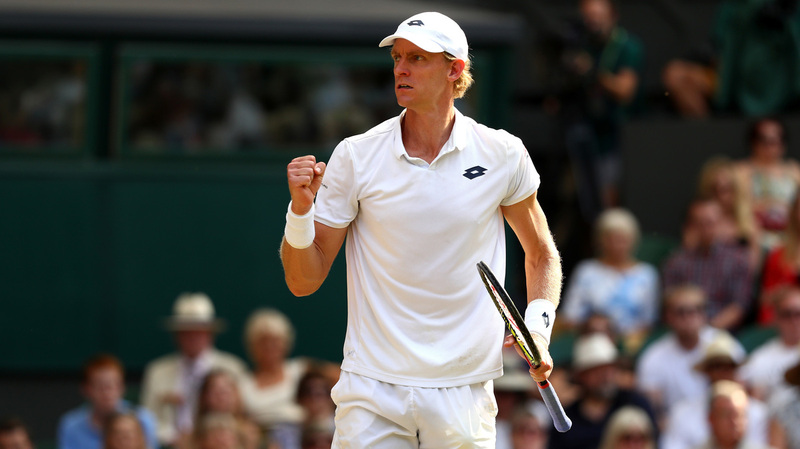 Kevin Anderson celebrates winning a point against John Isner during their long semifinal match Friday at Wimbledon. The match took a flabbergasting six hours and 36 minutes from first serve to the moment Anderson clinched the match. That moment, which took 99 grueling games to reach, sent the 32-year-old South African through to the final on Sunday, where he will play one of two legends of the sport, Novak Djokovic and Rafael Nadal. Anderson is the first South African to make a Wimbledon final since 1921. For now, though, let's allow Anderson the relief and joy of having won the longest Wimbledon semifinal in history by a long shot: Friday's match easily broke the previous records for number of games (72) and duration (a measly five hours and 31 minutes). It is also the second-longest match in Wimbledon history. As the seemingly endless epic unfolded, the world kept turning elsewhere — did you hear 12 Russians were indicted? Or that a former Pakistani prime minister was arrested? — but observers at Centre Court were treated to a spectacle tough to pry their eyes from. There was the deluge of aces (more than 100, in fact), the three tiebreakers, the final set that itself lasted nearly three hours. The match wasn't just notable because it was long. There was this: the tumble Anderson took late in the match, only to somehow hop up, hit the ball left handed and ultimately claim the point — all as the typically stoical Wimbledon crowd gasped and screamed above them. That point ended up actually setting up the winning break for Anderson. The final score: 7-6(6), 6-7(5), 6-7(9), 6-4, 26-24. Of course, there was another player on the other side of the net — for whom Anderson's triumph was a tragedy: Isner. The defeat especially stings because marathon play is nothing new to the 33-year-old American. Isner also took part in the longest match — period, no caveats — in tennis history, which, astoundingly, nearly doubled the duration of Friday's contest. In that one was at Wimbledon too but came at a much earlier stage. It was back in 2010, and he came out on the winning side against Nicolas Mahut in 11 hours 5 minutes, across a span of three days. "John is a great guy and I feel for him," Anderson told the BBC after Friday's match. "If I was on the opposite side, I don't know how you take it — getting through something like that is quite different." But he had nothing but gratitude for the role Isner has played in his career as a competitor.